Scientists have discovered a way to find your veins before poking around half a dozen times to find the spot. 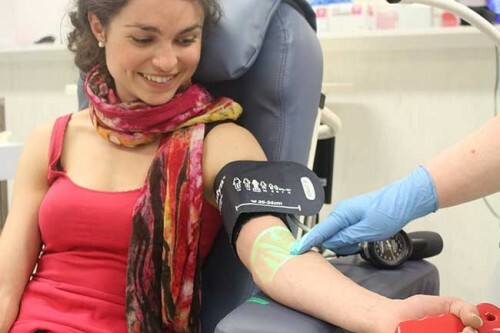 Now the Australian Red Cross Blood service is using the near infrared light device that locates blood to study whether being able to locate hard to find veins will result in reduced anxiety and thus make it more likely these types of donors will come back and donate again. The Blood Service says it will test 300 first timers and 600 returning blood donors between ages 18-30 on different devices from two separate Australian providers. The hope is that if this works on younger donors they will become lifelong contributors to the Red Cross. The vein visualization device works by waving a near infrared light source over naturally deoxygenated hemoglobin in the body. The deoxygenated hemoglobin absorbs that light and your veins show up in glowing green. The machines should be safe unless you stare directly at them (so don’t do that). They can also be adjusted for individual differences.